National President Hanley with recipients of the 11th Annual Black Eagle Awards (l-r): Kerry Prebisch, Vincenzo Pietropaolo, Paul Cavalluzzo, Gil McGowan (recipients Olivia Chow, MP and Governor Leonel Godoy Rangel from the Mexican State of Michoacán were unable to attend). Over the past decade the Cesar E. Chavez Black Eagle Awards dinner has brought together farm workers, social justice activists, and labour and faith-based organizations to celebrate the legacy of Cesar Chavez — and to honour individuals and organizations committed to the cause. Recently a sold out crowd of more than 300 gathered to honour this year’s recipients at the 11th Annual Black Eagle Awards held in Toronto, hosted by UFCW Canada and the Agricultural Workers Alliance. For the first time the Awards were presented for particular achievements in the labour, legal, cultural, academic, political and international arenas. 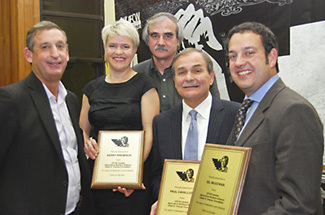 This year’s winners included constitutional lawyer Paul Cavalluzzo (legal), Alberta Federation of Labour President Gil McGowan (labour), NDP MP Olivia Chow (political), documentary photographer Vincenzo Pietropaolo (cultural), Professor Kerry Prebisch (academic), and in the International category, Governor Governor Leonel Godoy Rangel from the Mexican State of Michoacán. (For more on these remarkable individuals and their contributions to the cause follow their hyperlinks). The evening was also a time to reflect on the acheivements of the past year in the campaign for securing the rights of agriculture workers including the expansion of the AWA centres to ten locations; a number of media, lobby and legal campaigns that heightened public and media awareness about agriculture worker issues; first contracts at a number of location covering both domestic and migrant workers and other applications before the labour boards; as well as international action and consultations, lobbying, and the expansion of agreements with three sending states in Mexico for UFCW Canada and the AWA staff to act as advocates for workers from those states while in Canada.